The materials we use are powders and we assess their physical presence on that level. However these powders are generally composed of microscopic mineral particles (except for frits of course). In many materials these particles are homogeneous, equal citizens so to speak. In other materials there is a diversity of identities with very different shapes and sizes and different thermal, physical and electrolytic behaviors (thus there are complex interaction dynamics, especially as some of the particles begin to melt or decompose during firing and influence others, either to melt or to change their crystal structure, new crystal species may grow, transform then dissolve). However the mineralogy of clay is especially evident in raw physical presence of mixtures. For example, the plastic or slurry rheology behaviors of many raw clays are a product of the complex dynamics of the different mineral particles present. Understanding the mineralogy of materials is understanding why they do what they do physically. For example, why does a bentonite take three weeks to dry? Why does a fired bar made of calcium carbonate and clay fracture into a powder after sitting for a few days? Why do two different glaze slurries with the same clay content or even same recipe have different settling and hardening behaviors. Why do some clays shrink more and yet dry with fewer cracks than others, or why does one clay dry so much better than another of the same plasticity? Why do two glazes of the same chemistry but using different materials to supply that chemistry, melt at different temperatures? Why do some glazes have serious blistering problems? Why do some clays effloresce? Why are frits often better sources of oxides than raw materials. All of these are mineralogy questions (we are stretching the term mineralogy to include the study of of glass particles also). This area of the database attempts to capture information related to the mineralogy of materials. Many materials we use are simply crushed natural rocks, they thus have an exact mineral counterpart (e.g. silica is crushed quartz, calcium carbonate is crushed limestone). Other materials are blended minerals or they have been processed to remove impurities or they have been altered somehow in their crystal structure (e.g. by calcining). Regardless, there is still a need to understand why they have the physical properties they do, and those answers are at least partly (and sometimes fully) found on the mineral level. Some material data sheets show both the oxide and mineralogical analyses. Dolomite, for example, is composed of calcium carbonate and magnesium carbonate minerals, these can be separated mechanically. Although this material participates in the glaze melt to source the MgO and CaO (which are oxides), it's mineralogy (the calcium and magnesium carbonates) specifically accounts for the unique way it decomposes and melts. A great reference if you are interested in the supply side of ceramic minerals. 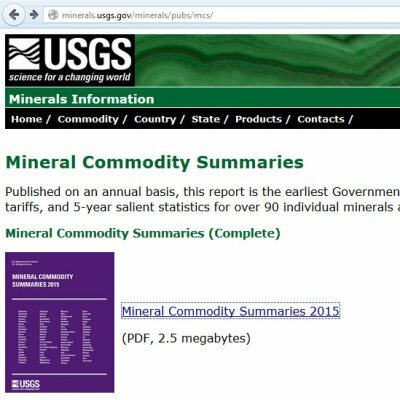 Many of the minerals dealt with in this report are ceramics-related. For example, did you know there are 160 companies mining clay in the US! They mine 4.5 million tons (mt) of bentonite, 6mt of kaolin, 1mt of ball clay, 11mt of common clay. What are the ton prices? Check for yourself. One can look at a ceramic material from a mineral, physical or chemical standpoint. Each viewpoint is appropriate depending on the context, understanding this is a key to exploiting materials properly. Understanding the theory behind sieve selection, how to properly sample a powder and how to carry out a particle size distribution test can give you valuable information about a material. Ceramic materials are not just powders, they have a physical presence that make each unique and amazing. We cannot adequately describe the properties using just numbers, thinking in terms of generic materials is a key.